Hi Sriram, this looks so delicious and healthful. I love food like this-it is real! Thanks Stella, try and aim for that at all times. I featured your recipe on my blog today! Thank you so much Tasha!. I am just seeing this now. Better late than never for the thanks! 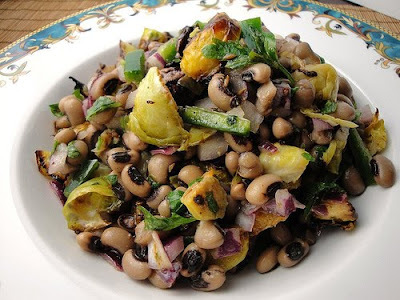 I was looking for a recipe for New Year's Day that combined black eyed peas and brussels sprouts and came across this. It was a huge hit - even won over people who 'hate' brussels sprouts! Doesn't look like this blog has been updated in a while but wanted to say how great this is and thank you! Thank you so much for your comment. I am so happy that you liked the recipe and it ended up being a hit with the folks. I have been wanting to get back for a while with the cooking. Hopefully very soon.